Is the big Eagles fan who ran into the subway pillar OK? 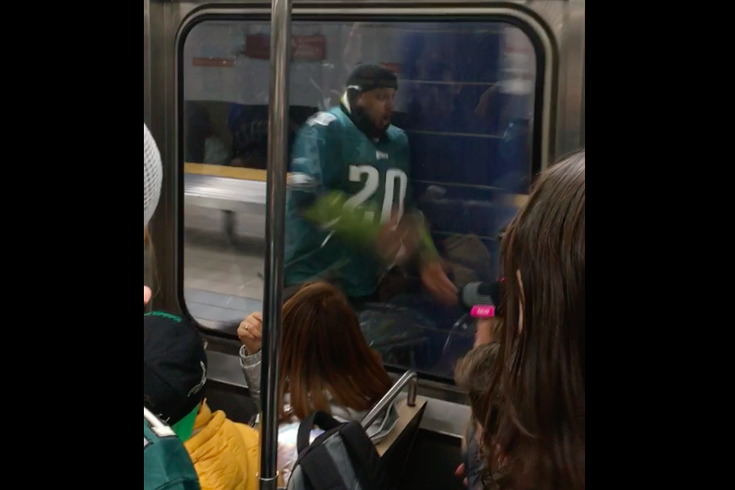 The moment one unfortunate Eagles fan ran into a pillar on a Broad Street Line platform after the Eagles NFC Championship Game victory. It's early Monday afternoon, and I'm worried. Not about Super Bowl LII. After what the Eagles did to the Vikings on Sunday night, the game in 13 days is merely a coronation formality. They got this. Take the 5.5 points; bet the mortgage payment. What I'm worried about is that burly fella in the Brian Dawkins jersey. It's but five-seconds long. Eyewitnesses and SEPTA officials report that this happened BEFORE THE GAME EVEN STARTED. The viral avalanche started off of a post from Redditor JVR2128. This moment in time not only raised the level from the post-Atlanta victory oral love session on the train, but also raised so many questions. For instance, what was he trying to do? You have to think he was gonna try to jump onto the train at the Ellsworth-Federal stop and ride it WHILE HANGING ON THE OUTSIDE heading south toward Tasker-Morris. Well, you'd be wrong if that's what you thought. Meet John Markman. He's a 24-year-old who lives in Center City. He and his buddy Emmet Ashton were heading northbound to watch the game around 6 p.m. after having tailgated with friends for about four hours. Ashton, who doesn't have a social-media presence, filmed the magical moment. From there, Markman posted it to Reddit. "People are saying that it seemed like he missed the train, but that's not what happened," Markman reported. "He was on the platform trying to hype fans on the train up. Banging on the windows. Screaming all sorts of nonsense. He was drunk and he was hyped." Motivations became afterthoughts when that blue steel pillar leveled a shoulder block that sent him spinning in the air as the train rolled on. It is very good that he didn't run head first into the pillar. That could've been a watch-the-Super-Bowl-in-the-ER game changer. It could have prevented him from even seeing the Eagles dismantle the Vikings, as well. The video, like many other magical moments across Philly last night, has gone viral, but is he OK? "We didn't see if he got up," said Markman. "Some people were concerned, but everybody got back to drinking and cheering quickly. Everybody thought it was pretty funny. We didn't expect the video to go viral." The dude seemed so lubed up that he mightn't feel the ramifications of the block till Monday morning. Still, I made a few calls to check into public-safety response to The Pillaring. Philadelphia police deferred questions to SEPTA police as the subway platform would be their jurisdiction. Chief Tom Nestel of SEPTA Transit Police said no report was filed in the incident. (That means there likely was not a medical call made to the scene). I asked him if he had any warnings regarding the safety of chasing trains as that gentleman did. "So many things pop into my head like that pole did for him," he said. "Those subway poles are like the Eagles defense. You're just not going to get past them." The reason all heroes don't wear capes is because they all wear Dawkins jerseys. And, if you know him, please tell him to drop me a line. I'd love to talk about the life lessons learned from this moment in time.